Discussion in 'backup, imaging & disk mgmt' started by PaulBB, Apr 6, 2012. Disk fragmentation is generally main cause of slow and unstable computer performance. Jwansoft Disk Defrag helps defragment your hard drive most efficiently. Jwansoft Disk Defrag not only defragments computer deeply but optimizes disk performance. 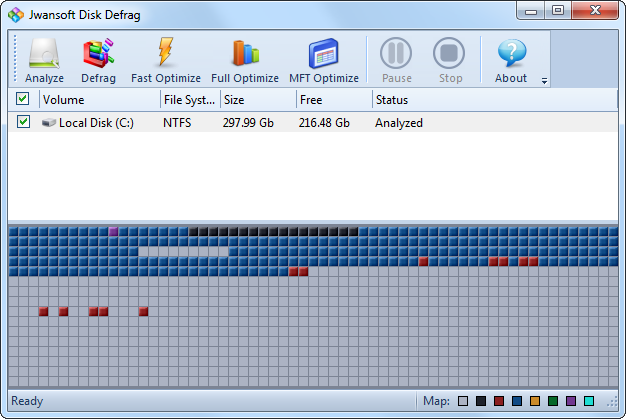 Jwansoft Disk Defrag keeping your hard disk running at its speediest. Slow down, freeze-ups and crashes will be a thing of the past. "It is known that disk fragment has been a primary cause of slow and unstable PC performance." Not in my experience. I'd be willing to say never with any computer I have ever touched (probably over 200 or more!) I do defrag occasionally but it's just for that last little bit of housekeeping. I can't think of a time it was THE solution for anything I was trying fix/repair. Is it hooking the keyboard? Automated analysis from threattrack and threatexpert suspect it. Just asking : what are threatrack & expert ? Thanks ! That's good to know. Thanks but no thanks....I,ll stick with the likes of Jotti,Virscan,Virus total....Why would I want to give out my E-Mail address for this? ?